What Are the Different Types of Prophylaxis? 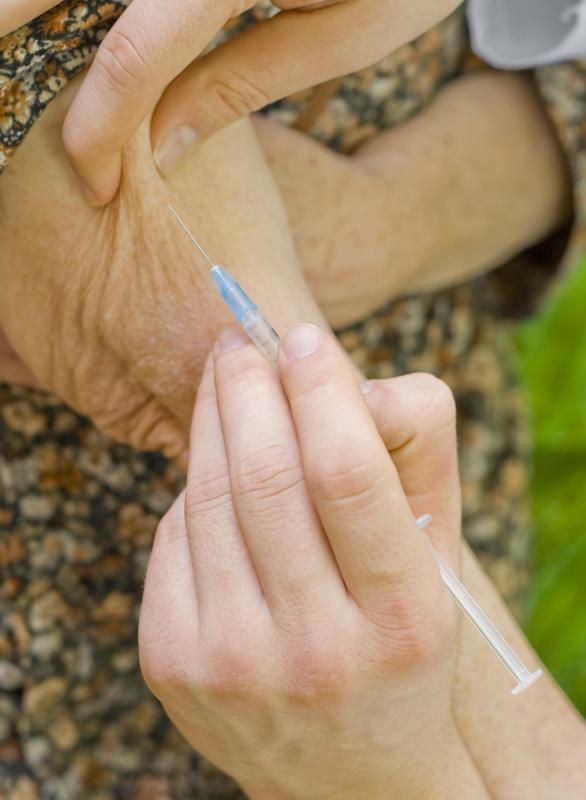 Elderly people receive yearly influenza shots to prevent them from getting the flu. Prophylaxis is an important concept in the fields of medicine and public health because it offers a way to prevent disease. Some types of prophylaxis can include good health maintenance, vaccination for preventable illnesses, treating people susceptible to being affected by a disease outbreak, and preventing the development of various complications in at-risk populations. The importance of disease prevention in health care is demonstrated by an emphasis on various kinds of prophylaxis. One important aspect of preventative medicine is health maintenance, which is accomplished by pursuing healthy activities in a number of ways. Steps individuals can take include eating nutritious foods, maintaining a healthy weight, and getting regular exercise. Primary care physicians can provide other types of health maintenance by regularly monitoring their patients’ blood pressures, cholesterol levels, and weights. Dentists provide regular teeth cleaning in order to prevent cavities and gum disease. By ensuring that a basic level of health is maintained, many common diseases can be prevented. Another aspect of prophylaxis is vaccination, which can offer protection against many infectious diseases. Babies are required to get vaccines for diseases such as measles, hepatitis B, mumps, rubella, diphtheria, chicken pox, and others before they enter school. Other at-risk people also get vaccines. For example, elderly people receive yearly influenza shots to prevent them from getting the flu. Prophylaxis can also be important in the setting of an outbreak. If one person in a community gets bacterial meningitis, for example, people who had contact with that person can be treated with antibiotics in order to prevent them from developing this infection. Outbreaks of pertussis, commonly known as the whooping cough, are treated similarly, and those who have been exposed are given medication as a preventative measure. A number of prophylactic measures are commonly undertaken with hospitalized patients because they are at increased risk for various complications. Patients on respirators are treated prophylactically for the development of stomach ulcers with medications that decrease the production of acid in the stomach. Blood clots are more common in hospitalized patients because they are immobilized for a long period. Therefore, prevention in the form of compressive stockings or blood thinners is given to many hospitalized patients. There are a number of other applications of prophylaxis in the health care field. Condoms are considered prophylactic agents because they help to prevent the spread of sexually transmitted diseases. Another type of prophylaxis involves the surgical removal of body parts prone to certain cancers. For example, women with gene mutations putting them at risk for breast cancer might get prophylactic mastectomies. Medications can also be taken prophylactically, such as the anti-malarial medications routinely taken by those traveling to countries where malaria is prevalent. What is Deep Venous Thrombosis Prophylaxis? What is Dental Antibiotic Prophylaxis? What is the Post Exposure Prophylaxis for HIV? What is a Meningitis Prophylaxis?